Simply put, storm surge is an abnormal rise in sea level accompanying a hurricane or other intense storm, and whose height is the difference between the observed level of the sea surface and the level that would have occurred in the absence of the cyclone. Storm surge is usually estimated by subtracting the normal or astronomic high tide from the observed storm tide. Because of improvements in forecasting, the spread of information and timely evacuations (all coupled with a little luck), the number of fatalities from hurricane storm surge has been drastically reduced over the past 30 years. However, the element of risk is always there. It is quite simple: if you are caught in a storm surge while in your home or even worse, while in a vehicle, you will probably not survive. Therefore, with the enormous increase in coastal populations, it is more critical than ever to understand the risks from hurricane storm surge; and more importantly, heed the warnings and evacuation orders given by local emergency management officials. The rise in water, coupled with the battering waves on top of the elevated water level is the reason that sometimes millions of people are urged to evacuate their coastal homes. Storm surge in the open ocean. Category 2 and 4 hurricanes at the beachfront. First, let’s make sure we all know what a hurricane is.By definition it is a warm-core, tropical cyclone with counter-clockwise rotating winds of 74 miles per hour or greater. A hurricane has much lower air pressure at its center (the eye) than at its periphery. It is this difference in air pressure that allows the wind to spiral inward towards the center. Hurricanes need warm ocean water (at least 80 degrees F) in order to thrive. They also need a moist environment and non-shearing winds in the upper atmosphere so that the hurricane can grow vertically. Hurricanes typically move in a course around the Bermuda High, a large high pressure system typical for the mid-atlantic region. Some hurricanes move on erratic paths and can be difficult to forecast. We’ll look at several different types of paths that hurricanes take and examine the ones most likely to bring worst case conditions to our area. We name hurricanes to keep track of which one is which. Common sense, really. We began officially naming tropical storms and hurricanes in 1953. In 1979 we added male names to the list of names; which is comprised of six annual lists that are rotated every six years. If a tropical storm or hurricane causes notable death and destruction, the name is "retired" off of the list and replaced with another name. So MITCH will replaced by another "M" male name in 2004. Before we get much further into how a hurricane generates a storm surge, let us examine tides and why the daily tide cycle can have dramatic effects on the height of a storm surge. The high and low tides are caused by the gravitational force of the Moon. The Moon literally pulls on the oceans as it rotates around the Earth. The pull is enough to raise the ocean level by several inches to many feet- depending on several geographic factors. While the ocean level rises in one location, it is lowered across the opposite side of the earth- thus causing a low tide. There are typically two high and two low tides every 24 hours. North Carolina has a moderate tidal range. In other words, the difference between the mean tide level (the average tide level) and high or low tide is only a few feet. However, this difference can have dramatic consequences when a hurricane makes landfall. Look at the illustrations below. They represent a generalized look at the differences in tide levels along the coast of North Carolina. 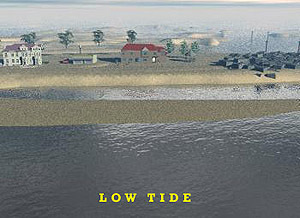 The first illustration shows low tide. 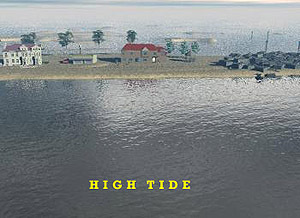 The second illustration shows high tide. 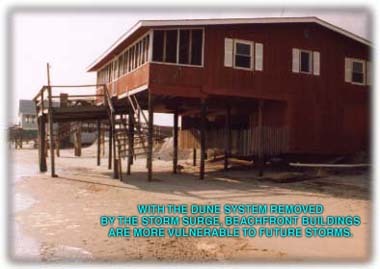 The effects of this difference on a hurricane storm surge are obvious. If the water level is lower by two feet or so during a low tide, then the resulting storm surge of a hurricane striking at low tide would be less by about two feet. Conversely, if the same hurricane were to make landfall at the time of high tide, then at least two feet could be added to the overall storm tide. Hurricanes are born from some type of "seedling" in the tropics and subtropics. Whether it be a tropical wave or an old frontal boundary that leads to hurricane formation, hurricanes are the top of the food chain, so to speak, in the tropics. The first stage beyond a tropical disturbance is a tropical depression. A tropical depression has winds of less than 39 mph and a defined, closed circulation with wind spiraling in from all directions to the center. The air pressure is not as low as a tropical storm or hurricane. A tropical depression has no name, it is just called "tropical depression #1, #2 and so forth. There is typically heavy rain associated with a depression but no storm surge to speak of. Moving up the scale, we get to a tropical storm. At this point the system gets a name, let’s call our model storm "LISA". Lisa will be our model for examining how a tropical cyclone brings storm surge ashore and the devastating effects that come along with it. A tropical storm has winds from 39 mph to 73 mph and a better defined wind field and overall circulation pattern. There may be minor storm surge flooding in a strong tropical storm in the areas just to the right of where the center comes ashore. This is especially so if the storm has a fast forward speed. We’ll look at why that is later on. Lisa is now a minimal hurricane. With winds of 75 mph, Lisa does not quite have an eye feature yet, but that will come soon. The air pressure has dropped to 985 millibars placing Lisa in the category 1 area of the Saffir-Simpson Hurricane Damage Potential Scale. Storm surge will be from 4 to 5 feet depending upon the exact track and location of landfall of a category 1 hurricane. Our hurricane, Lisa, will continue to strengthen as we jump up to a category 3 hurricane. Now Lisa is a category 3 hurricane on the Saffir-Simpson Scale. Lisa has winds of 120 miles per hour, a little stronger than Fran did in 1996. She is out in the Atlantic, northeast of the northern Leeward Islands. Lisa is about 5 days from making landfall in the Southeast U.S. The first sign of Lisa’s impending threat are the massive swells that are generated in all directions from the hurricane’s center. They move outward and arrive on our shores days after being generated by the powerful winds of our hurricane. As the swells encounter the coastline, dangerous rip-tides often result. So even though Lisa is still 9 days away, she is already creating a problem on the coast as the swells, or the forerunner waves, come rolling in. These waves typically add a foot or two to the overall height of the ocean at the beachfront. If Lisa were to pass harmlessly by and never get much closer, then these forerunner waves are all that we’d experience. Unfortunately, Lisa is going to come closer to the Carolinas. Let’s move ahead a few days. As Lisa draws ever closer to the Southeast Coast, the swells intensify, heavy surf advisories are often issued and there is a looming sense that a hurricane lurks a few hundred miles off shore. Indeed, Lisa is now 36 hours away from making a direct hit somewhere in Southeast North Carolina. With the seas building and a constant onshore wind, small craft (and indeed all marine vessels) are urged to remain in port and prepare for the hurricane. At this point a Hurricane Watch has been issued. It means that hurricane conditions are possible within the watch area with 36 hours or less. It is time to get ready for hurricane Lisa and the destrcutive storm surge that she will bring. Let’s assume that Lisa comes ashore at a normal high tide between New and Full Moon phases. As we can see here, Lisa is a powerful hurricane. 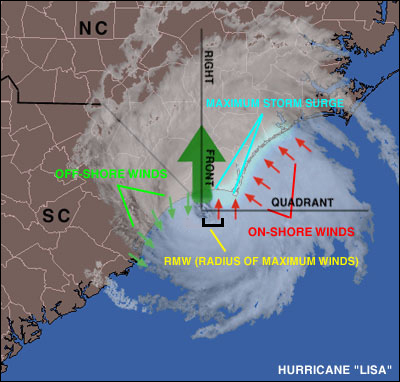 Looking at the diagram below, let’s examine some key features of Lisa as she makes landfall from the south into extreme eastern Brunswick county- with the eye coming up the Cape Fear River. The right-front quadrant of an Atlantic hurricane typically contains the strongest winds and thus, the highest storm surge. Keep in mind that the right-front quadrant is always relative to the forward movement of the hurricane. Because most hurricanes that strike North Carolina approach from the south, the right-front quadrant has also been the northeast quadrant as well. When the center of a hurricane (or even a tropical storm) approaches the coastline, the wind quickly picks up as the center approaches and acts to push the ocean onto the coastline. 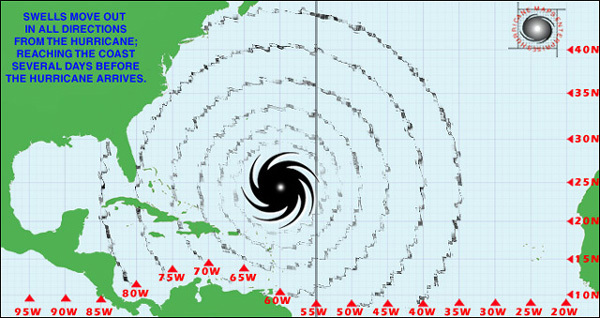 The diagram to the right illustrates how a hurricane that is moving onshore will pile up the ocean just ahead of the center or eye. The illustrations below depict a category two hurricane and a category four hurricane at the beachfront. The illustrations show the beach in profile to demonstrate scale. Notice the differences in the two scenarios. The category two hurricane causes dune erosion and minor ocean overwash on well nourished barrier islands. 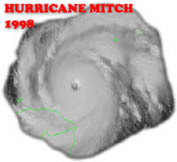 Thus the damage is typically minor as compared to what will likely occur during a category four hurricane. 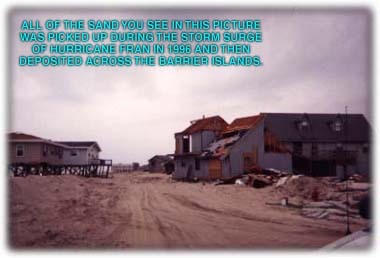 The photos below are from hurricane Fran’s storm surge in 1996 along Topsail Island, North Carolina. is a very important aspect to consider when determining the potential damage from a hurricane storm surge. Remember that the Right-Front Quadrant (RFQ) is the stronger side of the storm and will deliver the highest storm surge. A powerful hurricane can be roaring up the coast at a good 20 mph and pass us by to the east by only 20 or 30 miles. Yes, we will have hurricane force winds and heavy rains but we would be spared the destructive RFQ and the storm surge that accompanies it. Look at the diagrams below. Each one looks at different scenarios for different angles of attack. Notice that the Outer Banks are vulnerable to sound-side hurricanes as well as ocean-side hurricanes. As a hurricane parallels the coast, the dangerous RFQ stays offshore. There will be some surge and certainly some damaging winds and heavy rains. But this scenario does not offer the same direct hit that a perpendicular strike would yield. 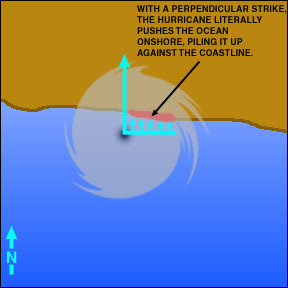 This diagram shows that the Outer Banks are vulnerable to sound-side storm surge flooding even if the center of the hurricane or tropical storm remains several miles offshore. The forward speed of the hurricane plays a critical role in the overall surge height. FAST MOVING HURRICANE: (15.1mph to 35mph) The surface wind stress is increased in the right-front quadrant thus creating a higher storm surge on the outer coast versus the storm surge from a slow moving hurricane. SLOW MOVING HURRICANE: (0 mph to 15.0mph) However, a slow moving hurricane may produce the opposite effect inside of a bay, estuary or river system. This is because slow moving hurricanes have more time to pump water into inland water bodies than do fast moving hurricanes. AND: There are also cases where neither rule mentioned above will apply. Posted : Marty Casado - Sat, May 22, 2010 1:40 PM. This article has been viewed 19299 times. What do I need to know about hurricanes?